A few minutes of intense exercise a week is just as good as a half-hour of moderate physical activity a day for reducing a person's risk of developing type 2 diabetes -- and may actually be even more effective, new research hints. "It is possible to gain significant health benefits from only 7.5 minutes of exercise each week -- if that is all that you find the time to do," Dr. James A. Timmons of Heriot-Watt University in Edinburgh, one of the researchers on the study, told Reuters Health. "This is a dramatically different view from current thinking," he admitted. Timmons and his team found that young sedentary men who did just 15 minutes of all-out sprinting on an exercise bike spread out over two weeks substantially improved their ability to metabolize glucose (sugar). Traditional aerobic exercise programs can boost sensitivity to the key blood-sugar-regulating hormone insulin. The high-intensity program did this too, but it also directly reduced the men's blood sugar levels -- something that standard exercise programs have not been shown to do. Current exercise guidelines recommend at least 30 minutes of exercise a day at least five days a week, but "the general population fails to follow such regimes due to lack of time, motivation and adherence," the investigators note in the journal BMC Endocrine Disorders. 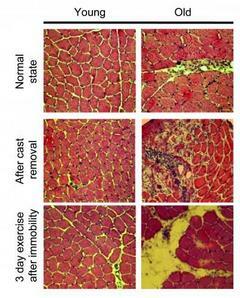 They hypothesized that high intensity exercise might improve insulin sensitivity more efficiently. The New York Times has an interesting if somewhat late article, "Stretching: The Truth"
"The old presumption that holding a stretch for 20 to 30 seconds — known as static stretching — primes muscles for a workout is dead wrong. It actually weakens them."